Costco had a brief sales slump this winter, but it is already bouncing back. Wal-Mart has a much tougher road to recovery. Costco Wholesale Corporation (NASDAQ:COST) has kept investors' favor during the past 10 years by posting fairly consistent sales and earnings growth. 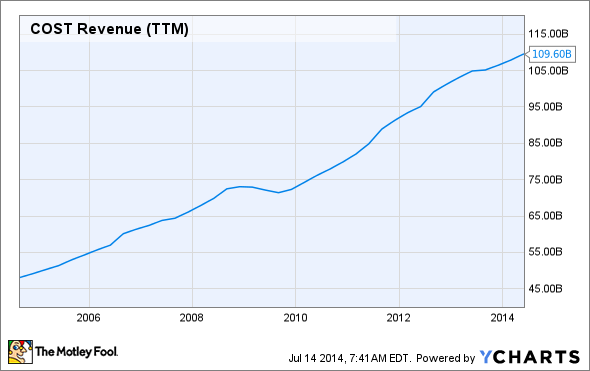 Aside from a slight dip during the Great Recession, Costco's revenue has been on a steep upward trajectory. Costco hit a bit of a slump this past winter, though. Through the first 24 weeks of the 2014 fiscal year (which runs through the end of August), Costco's comparable sales increased just 3%. That compares to 6% in the same period of FY13. As a result, Costco's year-to-date adjusted EPS is down slightly compared to the prior year. Costco's struggles this past winter were not unique. Lots of big retailers, including Wal-Mart (NYSE:WMT), faced sales and earnings pressure due to the combination of a shorter holiday shopping season, severe winter weather, and the weak economy. But unlike Wal-Mart, Costco is already bouncing back. Costco reports comparable sales growth in two ways. First, it reports a "raw" unadjusted figure and then it also reports a figure adjusted for changes in fuel prices and currency exchange rates. These factors can have a big impact on Costco's revenue, so this adjusted figure often provides a clearer look at underlying demand. This winter's sales slump consisted of a slowdown in Costco's underlying sales growth rate that was exacerbated by the strong U.S. dollar and lower fuel prices. As noted above, comparable sales rose 3% in the first 24 weeks of FY14 -- but comparable sales growth would have been 5% absent the negative effects of fuel prices and currency fluctuations. Since March, comparable sales growth has risen as the underlying demand picture has improved and the headwind from fuel prices and foreign exchange has lessened. In March, comparable sales reached 5%, or 7% excluding the impact of gas prices and foreign exchange. Costco's comparable sales growth has ticked higher in recent months. In the last few months, the headwind from falling gasoline prices has reversed, and the headwind from foreign exchange has become much smaller. In May and June, comparable sales increased 6%, with or without the impact of fuel and currency rates. This culminated in 10% total sales growth for Costco last month. Wal-Mart won't have nearly as easy a time bouncing back from its sales slowdown, which stretches back all the way to the beginning of 2013. U.S. comparable-store sales -- including the Walmart U.S. and Sam's Club divisions -- fell 0.4% last year. This trend continued in Q1 of FY15, as comparable-store sales fell 0.2%. Moreover, due to Wal-Mart's massive size, new store openings can't move the needle very far anymore. On a global basis, Wal-Mart's sales increased just 0.8% last quarter. By contrast, new warehouse openings add several percentage points of sales growth for Costco. Wal-Mart does have a plan to reinvigorate growth by opening hundreds of smaller "Walmart Neighborhood Market" and "Walmart Express" stores in more convenient locations. But it will take several years of aggressive growth for these smaller format stores to make a significant contribution to total company sales. While Costco certainly faces challenges ahead -- such as adapting to the growth of e-commerce and attracting younger customers -- its rock-bottom costs and rock-bottom prices constitute tremendous competitive advantages. Even Wal-Mart (a $500 billion retailer) cannot rival Costco's cost structure. As much as people may value the convenience that other retailers offer, there will always be a large number of consumers looking for the best price. Costco's high-volume warehouse model allows it to deliver that consistently. As long as Costco continues to lead on price, it should continue to attract new customers and maintain or grow its wallet share among existing members. Costco's recent return to faster sales growth is no fluke, and I expect a corresponding acceleration in earnings growth starting this quarter.